Services: 2,500sqm of Car Park Coatings and Line-Marking/1,500sqm of Resin Coatings/1,000sqm of Self Level Screed. IFT were contracted by Ogilvie Construction to install a range of flooring services to the new build Jaguar Land Rover showroom on Wellington Rd, Aberdeen. 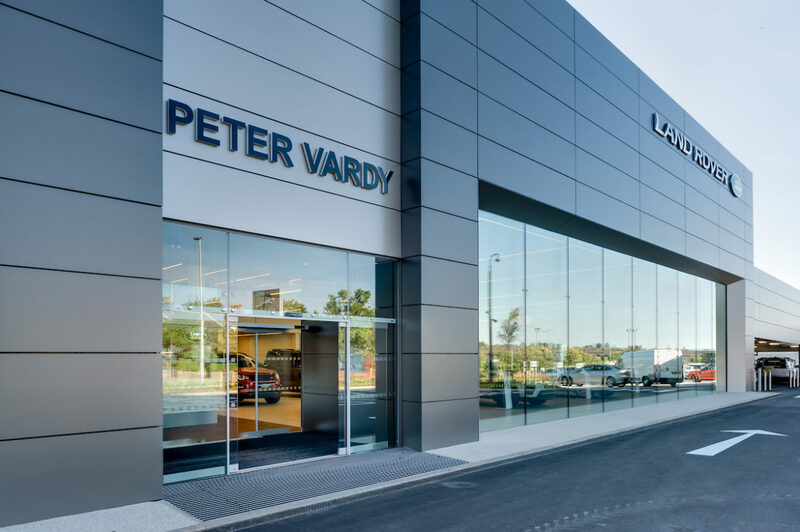 The project involved the construction of a custom built £8million showroom owned and operated by Peter Vardy. The building is arranged two floors, ground and mezzanine, linked by escalators, with exposed car park deck and extensive service area. IFT installed a rapid curing car park decking and line marking system to the external raised deck which extends to 2,500sqm. A Deckshield Rapide ED system was installed throughout incorporating a heavy duty system to the turning circles. The principle benefits of this robust waterproofing system is that it can withstand heavy vehicular traffic under continuous use providing a seamless, crack bridging and visually appealing finish for an extended period of time. In addition, a Deckshield Rapide ED floor will achieve a full traffic and chemical cure within 2-3 hours of application. In conjunction with the car park decking we also installed 1,500sqm of anti-slip resin coatings and demarcation to the workshop and service bays. Our further involvement on the project included the application of over 1,000sqm of self-levelling screed to harmonise levels to assist in the successful application of the following floor finishes. The successful delivery of our works provides evidence of IFTs ability to provide a range of fully integrated flooring services. We are delighted to have played a critical part in the construction of this state-of-the-art showroom. I found IFT to be an extremely proactive and conscientious company to deal with. They completed a floor finish to the main workshop and a resin bond finish to the external car deck, both of which were completed in time and in budget, and to an extremely high standard. I would have no hesitation in working with this company again – from the management to the men on site, nothing was ever a problem and all works were carried out in a very professional manner.